These figures are the latest in a period of continuous growth spanning 19 calendar quarters and an ongoing period of double digit growth going back to Q4 2015. IDEA members are upbeat about the immediate future and believe that the European electronic components market will continue to grow throughout 2018/19 but at a slightly lower pace, and until capacity increases extended manufacturer lead times will probably affect availability of all electronic components. The data presented in the following graphics is shown in Euros and where necessary has been converted from local currency at a fixed exchange rate for the year. The blue bars in Graphic T1 show Q1 2018 Billings growth of 15% when compared to the previous quarter and seven percent growth compared to the same period in 2017. The brown bars show that Bookings grew by eight percent in Q1 2018 when compared to the previous quarter and seven percent Bookings growth compared to the same quarter 2017. The decline in the book-to-bill (B2B) ratio over the first three quarters of 2017 from – 1.09:1 down to 1.04:1 – indicated that Billings growth would slow into Q4, which in the event proved to be true. However, the 1.15:1 B2B ratio reported for Q4 2017 suggests optimism that Billings growth would probably increase as we moved into Q1 2018, which it duly did. Whilst welcome, this stronger than average growth performance is much in-line with broad historical industry trends for the first quarter of the year. 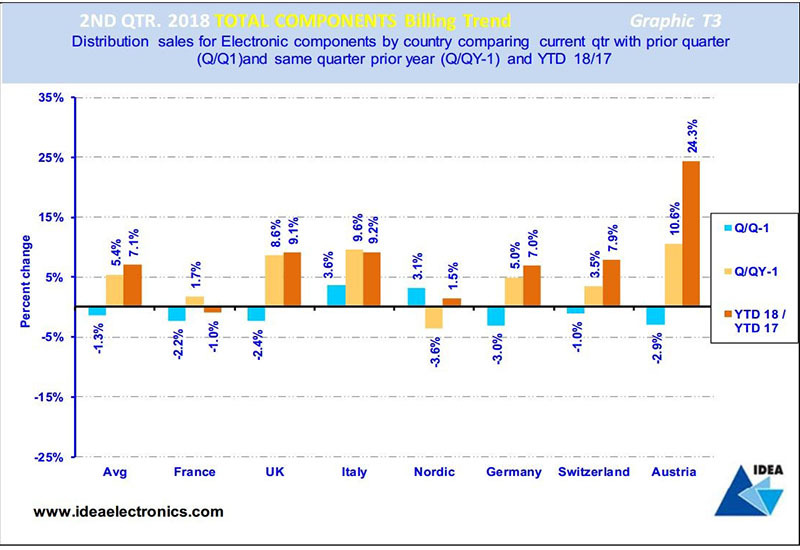 Graphic T2 compares the total electronic components Bookings achieved in each country in Europe in Q1 2018 and contrasts and compares the results with the previous quarter’s results and those achieved in the same period last year. The blue bar reveals that in Q1 2018 Bookings in the French and German components markets increased faster than the European average of eight percent growth when compared to the previous quarter. The light brown bar compares Q1 2018 with the same quarter in 2017 and indicates that Bookings growth in the Italian and Germany components markets increased faster than the European average of seven percent in the period. 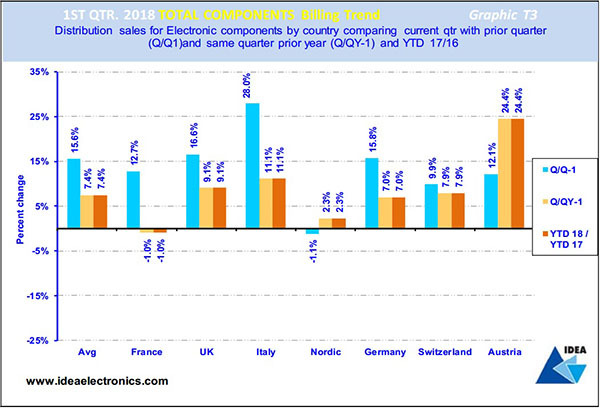 However, all European electronic components markets enjoyed strong Bookings growth in Q1, averaging out at 13.6%. The dark brown bar compares Bookings achieved year-to-date (Y2D) with the same period in 2017, revealing an average Bookings growth rate of seven percent over the 12-month period. Note that the Italian and German markets grew faster than the European average. 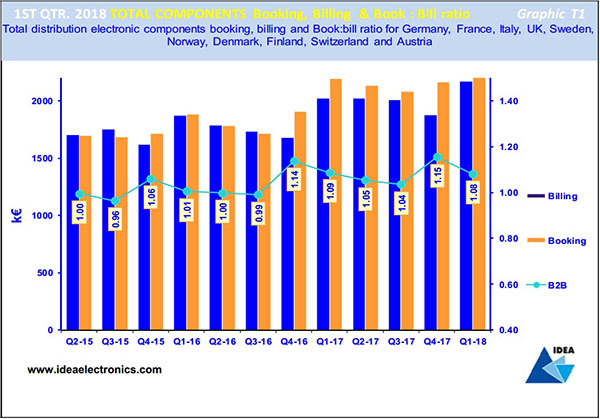 Graphic T3 illustrates the total electronic components Billings achieved in Europe in Q1 2018 and contrasts and compares the results with the previous quarter’s results and those achieved in the same quarter 2017. The light brown bars compare Q1 2018 Billings with the same quarter in 2017 and show that growth in the UK, Italian, Swiss and Austrian electronic components market increased faster than the European average of seven percent, with Germany just below the average and the French and Nordic region well below. The dark brown bars compare the current year-to-date Billings with the same period in 2017, revealing that the UK, Italian, Swiss and Austrian components market grew faster than the European average of seven percent growth, with Germany just below the average and the French and Nordic region well below. The association’s members reported Billings growth of seven percent when compared to the same calendar quarter 2017, extending an ongoing period of double digit growth going back to Q4 2015 and continuous growth spanning 19 calendar quarters. IDEA members are upbeat about the immediate future and believe that the European electronic components market will continue to grow throughout 2018/19, albeit at a slightly lower pace. They believe that extended lead times will continue to have an impact on availability of almost all electronic components (particularly large case size MLCC and chip resistors) until component manufacturers have increased manufacturing capacity. Each month IDEA collates the statistical data reported by its member associations throughout Europe and consolidates it before publishing it as headline information. IDEA uses three primary metrics in its reporting process: ‘Bookings’ (net new orders entered), ‘Billings’ (sales revenue invoiced, less credits) and the ratio of the two known as the ‘Book to Bill’ (or B2B) ratio. All three metrics are important, but the ‘Billings’ number is possibly the most critical value: “It’s the most accurate indicator of the performance of all organisations operating in the market,” said Fletcher. “Organisations are able to use the ‘Billings’ figures to compare their actual operating performance with the market’s average sales revenue performance”. The data presented in the following graphics is shown in K€ Euros and where necessary has been converted from local currency at a fixed exchange rate for the year. Graphic T1 shows Billings grew in Europe by 7.1% in Q2’18 compared to the previous quarter and by 5.4% compared to the same period in 2017. Booking grew by 8.2% compared to the previous quarter and 7.3% when compared to the same period in 2017. This performance is broadly in-line with historical industry trends for the second quarter of the year but average growth rates are notably higher. The book-to-bill (B2B) ratio over the first two quarters of ’18 has remained fairly stable but IDEA predicts a decline as we move into Q3’18. 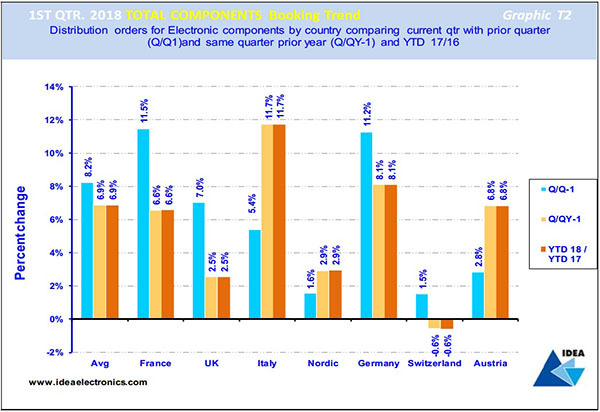 Graphic T2 compares the total electronic components Bookings result achieved in each country in Europe in Q2’18 and contrasts and compares the results with the previous quarter’s results and those achieved in the same period last year. The blue bar reveals that Average Bookings declined by (2.1%) across Europe in Q2’18 when compared to the previous quarter with the French, Italian and German components markets declining at a faster rate than the European average. Note that the UK, Nordic, Swiss and Austrian markets all showed growth. The light brown bar compares Q2’18 with the same quarter 2017 and indicates that Bookings growth in the UK and Germany components markets increased faster than the European average of 8.2% in the period. 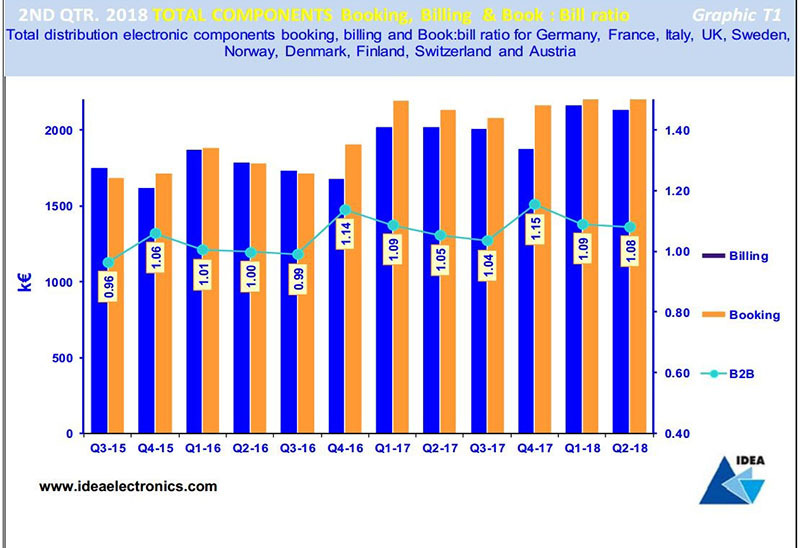 However, all European electronic components markets enjoyed strong Bookings growth in the quarter, averaging out at 8.2%. The dark brown bar compares Bookings achieved year-to-date (Y2D) with the same period in 2017, revealing an average Bookings growth rate of 7.3% over the 12 month period. Note that the UK and German markets grew faster than the European average. Graphic T3 illustrates total electronic components Billings achieved in Europe in Q2’18 and contrasts and compares the results with the previous quarter’s results and those achieved in the same period last year. The blue bars compare Q2’18 Billings with the preceding quarter’s figures revealing that the Italian and Nordic electronic components markets grew faster than the European average of a decline of (1.3%) in the period, with all the other markets returning Billings decline greater than the average compared to the previous quarter. The light brown bars compare Q2’18 with the same quarter the previous year and reveals that with the exception of the French electronic components market, all European components markets experienced growth averaging 5.4%, with the UK, Italy and Austrian markets growing faster than the average. 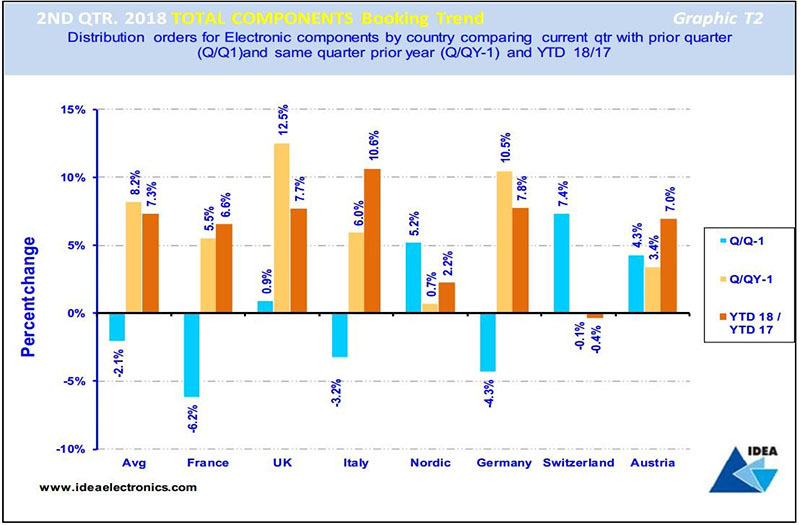 The dark brown bars compare the current Y2D Billings with the same period in 2017, revealing that the UK, Italian, Swiss and Austrian components market grew faster than the 7.1% average European Billings growth Y2D. Germany is hovering just below the average while France is lagging behind.